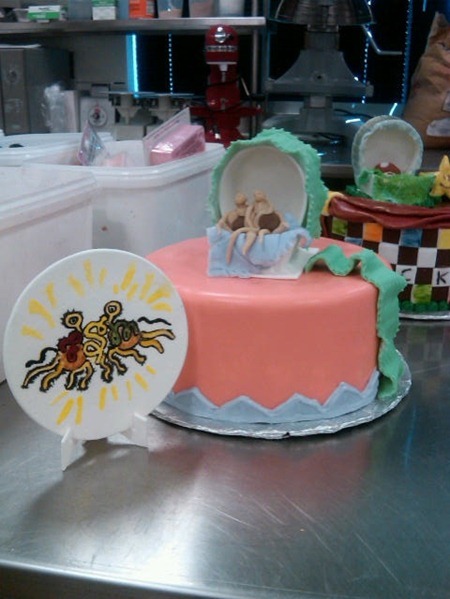 Here is a cake that I did in my class at Le Cordon Bleu. It should be a rum (grog) cake. Unfortunately it is not. I didn’t have any grog at my disposal, but I did have vodka. With all of the likely upcoming Pastafarian weddings (thanks to all of the newly minted FSM Clergy), Roscoe could have one heck of a Pastafarian Wedding cake business. Does anybody else see something besides the FSM here. The topping almost looks like a happy couple having a good time during a private moment. Es de gran ayuda tu aporte, Gracias. Si de verdad, chavo. Es muy bien. De nalgas.